The Magnetic Loom Sensor is an highly sophisticated and reliable device to sense the weft breakage, empty bobbin, and uneven weft tension in Circular Loom. The sensor is heavy-duty type and suits for environmental conditions of Plastic Woven sacks Industry. The sensor works on the principle of magnetism, there by eliminating the problems like dust, ambient light, reflection of fabric which are prominent in light based sensors. The sensor is totally sealed and hence, virtually no maintenance is required in day-to day operations. The design of sensor is such that, installation is very simple and requires fitting of boom reflector assemblies (with magnets fitted in place of diamond) on boom pipe, mounting of sensor on the loom and fitting of relay card in panel. The magnets are arranged in such a way that North and South poles of the magnets comes under sensor alternately avoiding magnetization of sensor. The 3-core wire from sensor connects to relay PCB. When shuttle bobbin runs out of the tape or if the shuttle tape breaks, then magnet rotates and comes under magnetic sensor, this magnetic field is sensed by sensor, and relay is energized. The contact of the relay stops the loom and cramming is started. 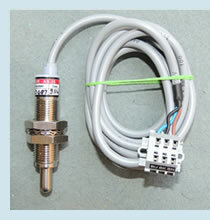 The sensor can be used on other types of loom also with modification in Magnet Holder. We have already developed the magnet holder for different make of loom. We can also design the magnet holder assembly for any other type of Loom. For Circular Loom of Woven Sack Industry. A reliable and dependable option for Photo Cell. 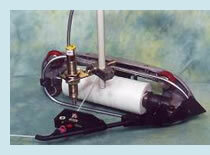 The shuttle bobbin can be completely utilized hence it is not necessary to put it on creel stand for further use. As smaller bobbins removed from shuttle are not loaded on creel, the creel stand can be loaded with large size bobbin and frequent stoppage to change creel bobbin is avoided. One operator can handle multiple loom as he does not have to monitor the shuttle bobbin constantly. The wastage due to tape breakage in shuttle bobbin is totally avoided, as loom stops (with cramming if enabled), immediately if tape breaks. As the Sensor is based on magnetic principle, the effect of dust and calcium carbonate is nil. The Sensor does not requires any maintenance. The efficiency of loom increases and quality of fabric is also improved as loom stops even if the shuttle tape is slightly loose. The pay back of the system is fast due to more production, improved quality, less down time of the loom and reduced wastage.